Waiting on Wednesday is a weekly meme hosted by Breaking the Spine. It's a way to spotlight the up-and-coming releases you are looking forward to. Readers everywhere are clamoring for books like Downton Abbey, the hit PBS Masterpiece Theater series that's taken America by storm. Those readers have become enthusiastic about The Danforths of Lancashire by award-winning author Murray Pura. In this stunning conclusion to the saga, we find Lord Preston and his family are gathered in London in the late 1930s for what turns out to be a homecoming. The family is finally all together again, gathering in a way they haven't been able to do for years. But looming ahead is the summer and fall of 1940 when both the Battle of Britain and the Blitz will occur. Though the family is blissfully unaware of this soon-to-be reality, Lord Preston, privy to top secret info in his position in the government, has grave concerns; the gravest he's ever had, that England will be invaded. The Danforth family patriarch does his best to hide his fears with a cheerful exterior, but is he successful? I love Downton Abbey, so when I saw this series it captured my attention. Beneath the Dover Sky ended right before WW2 was supposed to start between England and Germany. The Danforth family is spread out and some in the way of Nazi Germany. 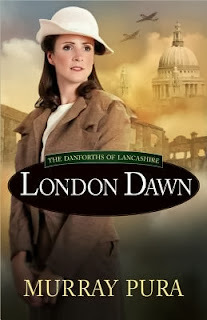 I can't wait to find out what happens to the family in London Dawn. ...I've got tons of WOW posts. Perhaps later I'll put one together. Rissi, I think you would enjoy it! The second book takes place over a ten year time. It's interesting what all is covered.